So i finally attended the Natural Birth Talk with the husband yesterday morning. I went ahead with Birth Maia by Kak Fadillah Yusope. It was really by chance, cos i PM-ed her on FB, asking if she might be opening a class soon and she said yes! Anyway, i got to know her from the FB Group The Gentle Birthing Ummi Support Group. You guys can join that group if you wish to read up on other local muslim mummies attempt on Natural Birth. So we started the day early yesterday and head over to Yishun for the class. Class was supposed to start at 10.00am but the other couples came late so we only started at about 10.30am. It was a small group, only 4 couples in the group so it was definitely an intimate session. I enjoyed the session and was quite worried Rusly might not enjoy the class but he was quite participative in the class and enjoyed the sharing session. We basically covered on how to achieve natural birth. The cons of episiotomy, induction, epidural and c-sections. Our rights as a birthing mother, what to do when we are having contractions / when our waterbag burst etc. One of burning question – when is the right time to go to the hospital because as much as i can, i would prefer to go through my initial labour pains at home instead of at the hospital. Thankfully, Kak Fadillah kept saying NUH is very pro-natural birth and mentioned how she and her clients have worked numerous times with Dr Citra and she is a pro-natural doctor who will try hard to adhere to your birth plans and not just throw it out of the window. So yes, i’m slightly relieved at that because i feel it’s useless to do up a Birth Plan if your gynae is gonna dismiss it and just go ahead with the template birth procedure. Sidetrack a bit, during my last appointment with Dr Citra, she mentioned she usually let her patients wait till 42 weeks if they can and i was pleased to hear that because honestly i don’t think many hospitals do that. 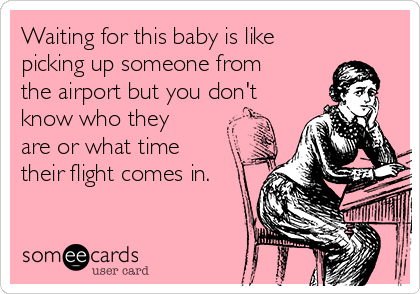 Usually, they’ll try to induce you at 40 weeks and get the baby out asap. However, she mentioned because i have GD, if my sugar levels rise too high closer to labour or if they think baby is getting way too big, she might have to induce me latest by 41 weeks if baby show no signs of making an appearance. But i did tell her we’ll play it by ear cos i really do not wish to be induced / have a failed induction which might result in a C-sect. But we shall see! – Natural Birth with no unnecessary medical interventions eg Induction unless Labour has not started at 41 weeks. – Epidural to be made available only if i request for it. – I prefer not to have episiotomy. – Able to walk around & move freely at the hospital and not be strapped constantly on the bed. – Able to eat & drink. – Quiet & Peaceful environment. I don’t want to hear nurses shouting at me to push macam National Day Parade because it’ll just make me tensed. I think as of now, it’s achieveable, except the part for no C-sect because i wouldn’t really know the dangers me & the baby will have to go through during labour until the day itself so yes, while i’m not inclined to have C-Sect, i’m not against it if that is the only way for me to get the baby out. While i rejoice over other mummies positive birth stories, i also have to be realistic with mine because we all manage pain differently and we can all plan everything to a T but ultimately, i leave everything to Allah SWT. I also hope Rusly remembers what he learn from this session because he have the potential to be a good support system for me. Currently, he’s very encouraging and accommodating and i’m glad to share this journey with him. I’ll probably print out a cheat sheet for him soon and paste it on the fridge so he’ll know what to do when the time comes. If you ask me, it was definitely worth sacrificing our sunday morning for this session. I’ve learnt so much and also know of the options i have with regards to birth. There is no right or wrong timing to attend these classes. Two other mummies in the class is in their 5th month. The other one is in her 3rd month. So naturally they were excited to hear i’m already in my 8th month. We’ve come to the next milestone, which is the 32nd weeks. So that’s 8 months of pregnancy! I did my final growth scan yesterday and met up with Dr Citra again for a review. The scan was alright although i would have preferred the sonographer who did my 28 weeks scan. The one i had yesterday was giggling too much. “This is the head.. heehee” “This is the body… heehee”. urmmm.. i’m supposed to be the excited one, remember? Also we couldn’t see baby’s face because her head is down already! She’s no longer in breech position and i hope she stays that way. Although i had a hard time explaining to Rusly because he kept saying things like “Baby dah head down, dia tak mabuk ke bila upside down?” Hahahaha. My husband, everyone. I had to remind him baby is in a waterbag, surrounded by water and probably don’t know she’s upside down ke upright ke sideways and he kept laughing at the image of baby upside down with her legs flailing about, macam as if so funny gitu. Actually if you come to think about it, memang funny ah. I also kept laughing at the the image of baby upside down. you have weird parents with a weird sense of humour who think upside down babies are funny. So anyway, based on the scan, baby is well and healthy. She’s at 1.7kg now which is the recommended weight for 32 weeks. My amniotic fluid is also still on a healthy level. All is good and i’m so relieved. Dr Citra also checked my Glucose level stats and said i’m an A* Student! In fact she was a little bit worried that my stats are a little on the lower side and told me to eat a bit more. Pulaaaakkk. I’ve also been experiencing Braxton Hicks. Didn’t know it was Braxton Hicks but Dr C told me so. It’s just some cramps and a really hard bump. I’ve had it mostly at night. Especially just before i sleep. It does not hurt that much but got me a little uncomfortable. Also having slightly more vaginal discharge these days but Dr C told me as long as it’s not green / foul smelling, it’s normal. So yeah, i’ll say that more or less, my third trimester is pretty textbook pregnancy. I also managed to score a seat for a Natural Birth workshop by a muslim Doula this sunday! Will share more about it after i’ve gone through it. I hope the next two months will be easy on me. It is a difficult time for me & rusly right now, with the recent going-ons in his family but we’re keeping ourselves positive that things would turn out right eventually. It is especially hard on Rusly now but i’m glad he thinks this pregnant woman is pretty easy to please and in his words “tak banyak kerenah”. I really think things happen for a reason and if it makes us a better person after all of His tests, then we’ll take it in stride. 30 down. 10 to go. Oh yes, we’re in the 30th weeks now! That means i have 10 weeks to go. That’s 2.5 months before i pop. I don’t know why but everytime i tell myself 10 weeks to go, it seems so near. I just hope that baby will stay snug in there for 10 weeks. Kalau tak sabar pun, stay for at least 7 weeks more ok.
Cos u’ll be full term by then and after that you wanna come out, keluar je lah. I ok je. You know, i thought i would be very excited about the Nursery. Actually i am lah. Just that i’m too lazy to think about decorating it. I’m waiting for the nesting period to kick in and then start worrying about the nursery. The baby cot has arrived though. It’s all assembled cos they did it all for us so it’s sitting all pretty at one corner. I don’t think we’ll be repainting the room. It’s currently mostly white with a grey wall on one side and i kind of like it grey because it’s a neutral colour so i think i’ll keep it grey with mostly white furniture and some pink decoration stuff. Like pillows lah and apa2 je lah. I have plans to DIY some deco stuff like the name blocks and posters. Actually i’ve done the artworks but i’ve not send them for prints yet because i’m just lazy. To think i print invitation cards for a living. All we need to buy now is the wooden blocks, photo frames & curtains from Taobao. Everything is in the shopping cart. Tengah tunggu nak checkout aje. We’ll be getting the MALM 6 Drawers from IKEA as her wardrobe because i wanna save space and baby clothes are so tiny i don’t think i really need a full wardrobe. That’s if i can control my spending on baby clothes lah. As it is, she has more clothes than Rusly already. Kesian laki aku. This is the colour scheme i’m looking at but looking at how unmotivated i am right now, i’ll be lucky if that room has a curtain. Tak kisah lah colour apa curtain tu. Janji tak pakai kain batik tutup tingkap. Not sure if it’s the pregnancy hormones at work again. Sod it. Really, it is the pregnancy hormones at work again. This morning, the mother called me to ask if i have kain batik at home for postpartum. I found it weird she’s asking me this so early. Afterall, we have another 2 months to go before i deliver. Well, technically i already am a mother? Just that my baby has not made an appearance. Yet. I don’t know why i got so emotional this time round because she does call me time to time to ask how i’m doing and all but lately i’ve been pretty exhausted. Lack of sleep, a heavy tummy and an Energizer baby kicking all day long (does she not sleep?) It’s been pretty sucky with all these pain but an exciting period for me, each time i feel her move inside me knowing that we’ll be meeting soon. Each day, i wonder how she’ll look like, what’s her personality like and stuff like that. I’m the first child in the family and i couldn’t help wondering, was this how my mum felt when she carried me many years ago? Uncertainty, excitement all rolled into one. Did my mom wake up with hands on her tummy, just like me? Did she spend her nights stroking her tummy to sleep, like me? Only thing i’m sure, just like me, my mom is also counting down to the day we see this little girl and if anything, this pregnancy made me appreciate my mother a whole lot more. 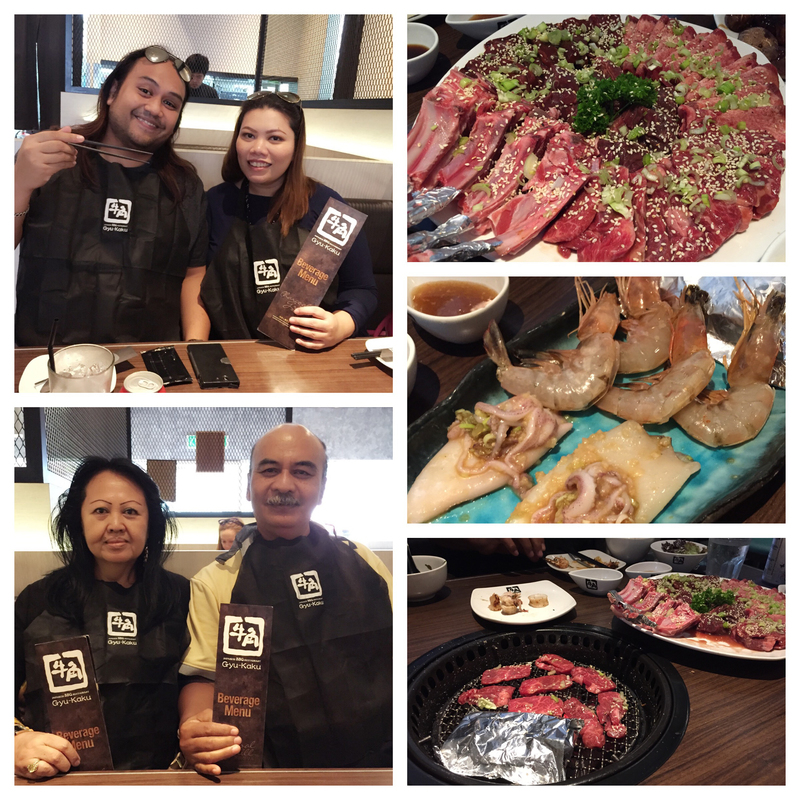 So we went to KL over the weekend to get my Tony Romas fix. It was a really short trip. We flew over to KL on saturday on the 8.45am flight and then back to SG on Sunday on the 5.00pm flight. Thank you Airasia for the many many SIN-KL flights. This time round, we brought my in-laws together with us. Although it was a wrong timing cos my MIL sprained her back weeks earlier and had difficulty walking and we had to do many pitstops so she can rest and sit down and take a breather. I almost felt guilty for dragging her to KL just so i can have my cravings fixed. But she said she enjoyed the trip. So i don’t feel that guilty anymore! And to think initially she was worried i would be too tired out from all the walking! But i walked like nobody’s business. On a sidenote, Rusly’s hair is of the same length as mine now. I think even longer and i’ve been pestering him to get it cut but he refused to listen! Macam nak bakar je rambut dia tau time dia tido. Our 1st stop right after we landed in KL was to head over to Publika Shopping Gallery. Initially i wanted to go to Journal by Plan B but we were so hungry by then, it was close to 12.00 noon already, and i was scared if we eat at Journal, then we wouldn’t have space for Gyu-Kaku so we went ahead to Gyu-Kaku instead. We were the 1st group to come in for lunch so one of the staff Mike offered to help us with grilling the meat etc and i was glad he did that cos that boy is good with his meat! I think if it was up to us to cook the meat ourselves, we’ll probably over-cook it and also cos four of us really macam tak kuasa nak masak mood. We ordered one of the set and in a second, we were overwhelmed with the amount of meat we have! For a while, i doubt we could finish them all up but yes we did! Sampai senget-senget.. Jalan pun dah macam lembu. I was out at 7.45am but only reached NUH about 8.50am cos of the traffic jam. So i was left with 20 mins for a quick breakfast. Especially cos i was already feeling nauseous. Not sure if it’s because of the cab ride or the morning sickness is kicking in again. 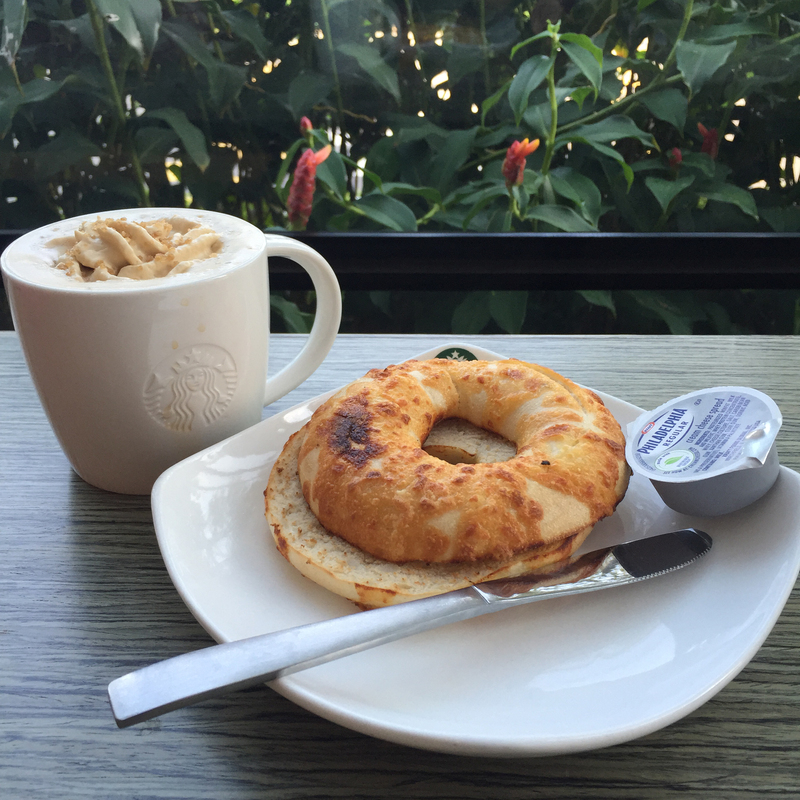 Grabbed my favourite Cheese Bagel for breakfast and Toffee Nut Latte. Because i somehow know if i don’t drink it now, i won’t be able to drink it nanti once i start recording my sugar levels. Hahahahaha Perangai buruk seh. Managed to finish up everything and go up to the Diabetic Clinic by 9.10am and i don’t know why, but i kind of expect the Clinic to be small but it was huge and there were so many people waiting for their turn! Obviously not everyone there is pregnant lah. Waiting time for Registration was quite long but other than that, it was quite a breeze but the whole appointment took a while cos i had to go through so many rooms and meet so many different people! I don’t know why my BP was slightly higher today at 132. It is usually at about 110 and never exceed 120. But maybe cos i was rushing and i was all flustered and hot. God, really really hot. Everywhere i go, i feel like the aircon is not working! After that, it was the finger prick test. My test result came back as 5.1, which is normal by their standard. I was secretly hoping my OGTT Test result was a fluke. Haha. Fat hope! Met Dr Pradip & Dr Claudia. Both doctors are so likeable! They reviewed my case and also enlightened me more about Gestational Diabetes. Both told me that if we treat it and keep my diet under control, a natural birth is possible. As of now, they will not put me on Insulin jabs unless my sugar level spike three days in a row. If that happens, it is an indication that controlling my diet no longer works for me. I asked Dr Pradip more about GD and it seems that the cause of it is not mainly because of what the mother feeds her herself during pregnancy but partly because of the extra hormones and how our natural Insulin is unable to cope with the extra hormones. For example, in the office, you have 10 Customer Service Officers to handle phone calls. Suddenly, you hold a promotion and lotsa people start calling in to place their orders and obviously the same 10 CSO won’t be able to handle the surge of calls right? That’s how the insulin feel. Suddenly my extra hormones is too much for them to handle so they only process what they can. However, with Gestational Diabetes, it’s hard to pinpoint when exactly things will go haywire as in, they won’t know how “hormonal” i would get hence the need to test for glucose level 2 times a week until i safely deliver my baby. If i have a surge in glucose levels for the day, i’ll need to do back-to-back test for 3 days in a row and if all three days indicates high level of sugar in my blood, i’ll need to call the clinic asap and arrange for insulin jabs. What happen if we don’t keep Gestational Diabetes under control? 1. Baby would be too large for Natural Birth and C-Section would be the best option for the mummy. I have no problem with C-Section. Although it is not a preference because i would prefer a quicker recovery so i’m more inclined to Natural Birth. But if i have to do C-Section, then so be it lah. As long as the baby is safe. 2. Baby would get too used to having too much sugar while she’s inside me, so naturally, her body will produce more insulin while she’s in my womb. However, when she’s born and only taking breast milk etc, her extra insulin would still be present in her body and later on when she does not have that much sugar intake and her insulin is so active breaking down all her sugars, obviously she’ll have low sugar levels. This is dangerous because it causes jaundice and difficulty in breathing and to be really honest, this is the part where i’m scared. I’m ok with going through C-Sect if it needs to be done. I’m ok if i have to take time to recover but i think i’ll blame myself if baby have low sugar levels when she is born later on. So i guess it is my responsibility to ensure that my GD is treated and under control. 6 weeks after delivery, i’ll have to do another OGTT. If my numbers are normal, then i’m cleared of Diabetes. However, if my number is high, it is possible i have Type 2 Diabetes and would have to receive treatment for it. So i’m making a conscious effort to keep my sugar levels as low as possible! – Monitor glucose levels with the finger prick test twice a week. – I can choose any two days i want but there will be 7 tests a day. Pre & Post Meals for Breakfast, Lunch & Dinner and also a Late Night Test before i go to bed. So in total, there will be 14 tests a week. Phew. I loaned the Accu-Chek Active from NUH but would have to get the test strips and needles myself and the test strips are so expensive ok! About $30 for 25 strips and that’s excluding the needles! 25 strips should be able to last me only 2 weeks since i need 14 strips per week. So i got my Father-in-Law to buy it for me instead since he also have Diabetes and get his from Polyclinic under subsidized rate cos of the Pioneer Generation scheme. heehee. and so we say Hello to the last trimester and hopefully it’ll be as smooth-sailing as the entire pregnancy. Admittedly, the 1st trimester is not exactly a bed of roses but kira ok lah kan.. Tak cerewet.. All the nausea and the morning sickness that came with it is quite normal & bearable actually. I know some people had it reaaalllly bad. Think Kate Middleton, sampai masuk hospital semua for morning sickness. Or maybe not ah.. she’s part of the Royal Family so obviously she’s given the royal treatment kan? But u get what i mean? Some people really had it bad, going in and out of the toilet from morning to night, so i shall not complain excessively about the 1st trimester because #inisemuanormal. 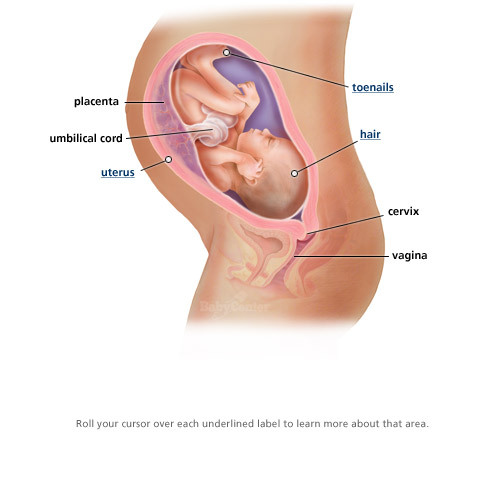 I had my 28 weeks Growth scan yesterday. It was an additional scan requested by my gynae cos of my low amniotic fluid detected previously so naturally i was pretty nervous. I didn’t read too much into it though cos i didn’t wanna scare myself unnecessarily. But for the last 2 months, i drank so much water, you cannot imagine! Cos that is the only way to counter the problem and Alhamdulilah, my amniotic fluid is back up in the healthy range. This time round, the waiting time was pretty fast, by that, i mean max 30-40mins wait. I managed to see baby on screen again.. She’s so big now, she’s filling up the entire womb space already. She’s now 1.1kg. No wonder i feel heavier. Went to see Dr Citra for the scan review after that, asked for the travel note and then she dropped a not so good news. I have borderline Gestational Diabetes. Told you i was scared of GD cos my mom had it during her pregnancies and actually i thought i’m safe from GD cos i didn’t hear any news from them.